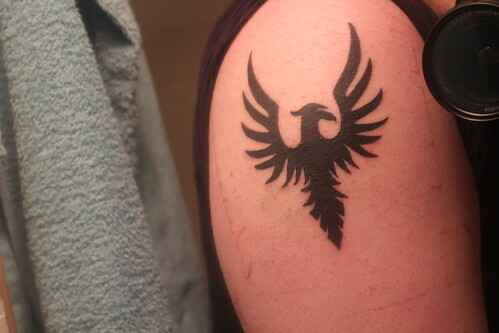 Around two months ago, I decided I wanted to finally get my first tattoo. I have wanted one for over eight years now, and finally I’ve made it a reality. If you’ve been on my Flickr account, you’ve already seen some pictures of it. I got it done at Neo-primitive Tattoo and Piercings in Hanover, Ontario. The experience wasn’t as painful as I assumed it would be. It felt like a knife cutting into my skin when she was doing the outline, and felt like a sunburn when she worked on filling in the design. Overall, I was in the chair for around an hour and a half and it wasn’t even as bad as the chest pains I sometimes get. The funniest thing was when I was showing the pictures of classic cars that I took in Hanover, my co-worker, Brad, saw the design and asked if it was mine. I told him yes, and he wouldn’t believe me until he saw it. It was kind of an embarrassing moment, but also quite funny. I’ve been thinking of getting a second one myself. That’s really cool! I just can’t think of what I’d want to have tattoo’d onto me.